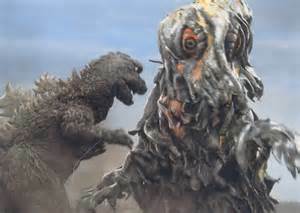 All Monsters Attack might be Godzilla’s worst film outing, but 1971’s Godzilla vs. Hedorah (AKA Godzilla vs. the Smog Monster) is certainly the strangest. It opens with a woman singing a song (“Save the Earth” in the US version) in a trippy 70’s nightclub with intercut footage of ocean pollution, and things only get more and more bizarre from there. 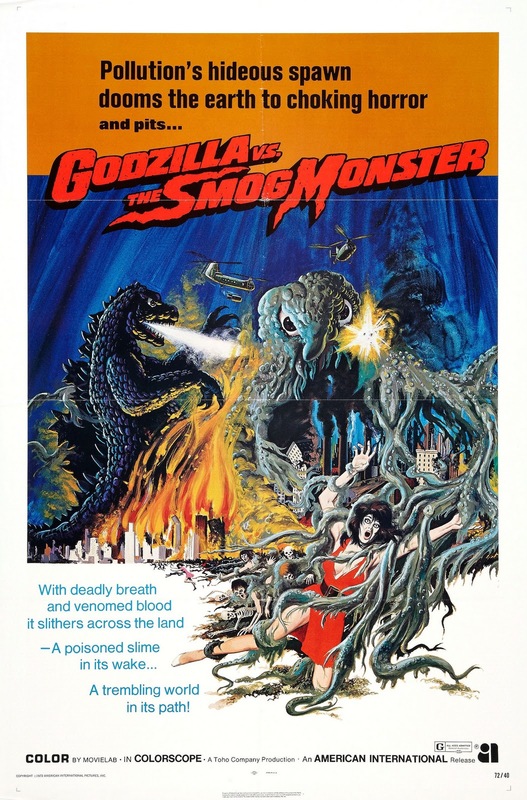 You absolutely cannot say that this isn’t one of the more unique Godzilla films, but it is also one of the most problematic. Continuing with the series’ focus on younger audiences, the film follows a young boy named Ken whose father discovers what appears to be an enormous tadpole. The appearance of this new species coincides suspiciously with an unknown monster’s attack on a fishing boat, and it doesn’t take long for Ken and his father to posit that the two events are related. 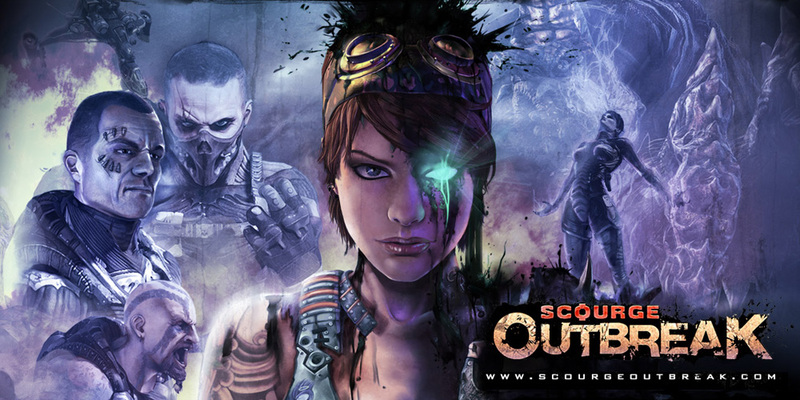 Seeking evidence to support their theory, Ken and his father head to the coast, but both are attacked and injured by a human-sized version of the gooey monster that destroyed the fishing boat. 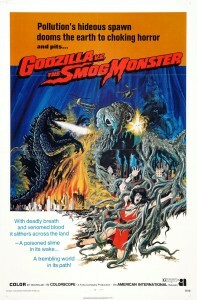 Ken dubs the monster Hedorah and determines that it was created from excess human pollution. Knowing there’s little hope for humans to succeed on their own, Ken places his faith in Godzilla to, ahem, save the earth from the sludgy new menace. Never one to ignore the pleas of children in need (well, except for in Mothra vs. Godzilla, when he seemingly intentionally tried to wipe out a group of schoolchildren), Godzilla emerges from the ocean to engage the Hedorah. This film has many, many problems, but chief among them is its tonal inconsistency. The narrative’s focus on the idealistic Ken gives you the impression that this film is aimed at children, but it’s filled to the brim with gruesome imagery that would disturb most adults. Even the brief animated segments (yes, there are intermittent animated satirical cartoons detailing Hedorah’s rampage) are creepy in a Yellow Submarine sort of way. More civilians are shown being killed in graphic detail than in any other Godzilla film – even the dead-serious Gojira. Those who fall victim to Hedorah’s poisonous vapors are shown deteriorating into skeletons in what has to be one of the most nightmare-inducing effects shots in any monster film. Images of children and small animals succumbing to Hedorah’s sludge also appear throughout the film, and there are very few moments of levity to lighten the unsettling mood. As for Hedorah himself, he is, like the film itself, one of Godzilla’s more unique adversaries. 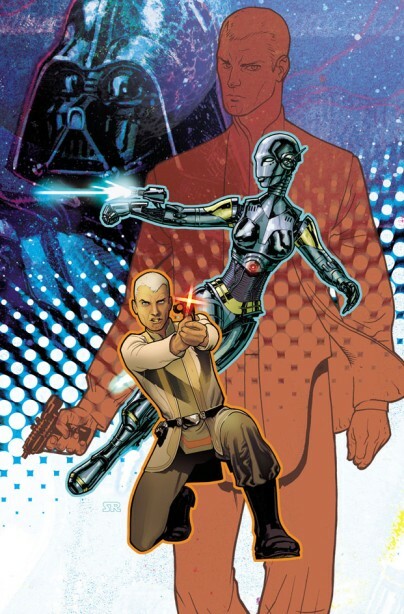 He has two forms: a smaller, flying form, and a larger, more humanoid form. Regardless of the shape he is taking, Hedorah is defined by his enormous, piercing eyes – eyes that no doubt haunted the nights of many children in the 70’s. Living up to his heritage, Hedorah’s disgusting attacks include farting out toxic globs of sludge and emitting deadly gas. Godzilla’s battles against Hedorah are no less unusual, and require him to employ some unorthodox strategies, even cooperating with the Japan Self Defense Force in the climactic battle. Most of the fights end with Godzilla gaining the upper hand before Hedorah changes forms and flies away, but Hedorah comes surprisingly close to defeating Godzilla by trapping him in a pool of sludge (at least I hope it’s sludge). Hedorah has the ability to regenerate from even a small amount of sludge, but a combination of Godzilla’s radioactive breath and an electricity weapon built by the JSDF are able to bring the monster down for good. It’s unfortunate that Godzilla vs. Hedorah’s quality is unable to match its ambition, but it at least remains an entertainingly bad film. It’s not the first film in the series to tackle serious social issues, but it is definitely the clumsiest about it. 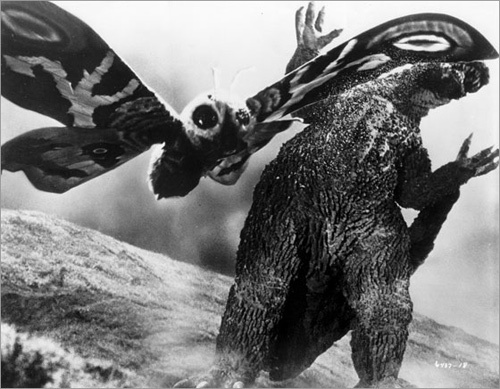 1954’sÂ Gojira was a nuanced examination of the responsibilities of a post-nuclear world disguised as a monster flick. This, for lack of a better term, is a bunch of hippie rubbish. Fun Fact: Longtime Godzilla producer Tomoyuki Tanaka, who was hospitalized during most of the production, was so horrified by the final product that he told director Yoshimitsu Banno that he ruined Godzilla and would never direct for Toho again. Memorable Moment: In order to catch up with a fleeing Hedorah, Godzilla aims his radioactive breath at the ground and flies after him. It doesn’t get goofier than this, folks.